URise Products developed the StandUp Walker, an innovative device designed to improve independence and quality of life for people suffering from mobility challenges. 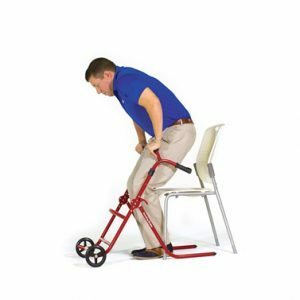 The StandUp Walker is a 2-in-1 device, providing the functionality of a standard walker while also helping the user lift themselves from a seated position. The device eliminates the need for appliances such as power-lift chairs and toilet seat risers, and it allows many seniors to move about freely without assistance. The StandUp Walker weighs only 10.5 pounds and can support up to 400 pounds. The design is collapsible, allowing for easy transportation. Alotech, Inc. worked with URise Products as the medical device contract manufacturer. Alotech worked with URise to bring the StandUp Walker to the market, guiding the product development cycle from its early stages into mass production. “Alotech worked with us on this product almost from inception,” says Paulus. The product’s initial inventor, Howard Liles, had supplied URise with an early prototype that he had built in a university lab. Alotech helped to carry the prototype into mass production through seven design iterations. Alotech ultimately found a way to reduce the cost of producing the stand-assist hinge by 80%, which proved to be a critical success factor. We helped URise to formulate the intellectual property and file the necessary patents while developing a cost-effective design and manufacturing process. Alotech currently manages all aspects of production and order fulfillment for the StandUp Walker, including packing, shipping and customer service. In October 2016, the StandUp Walker won the HME Business 2016 New Product Award (retail category) as well as Aging 2.0’s Pitch-4-Partners Award. By developing a proven cost-effective process with Alotech’s assistance, URise was able to reduce the need to raise startup capital, allowing its owners to retain a greater share of equity in the company.